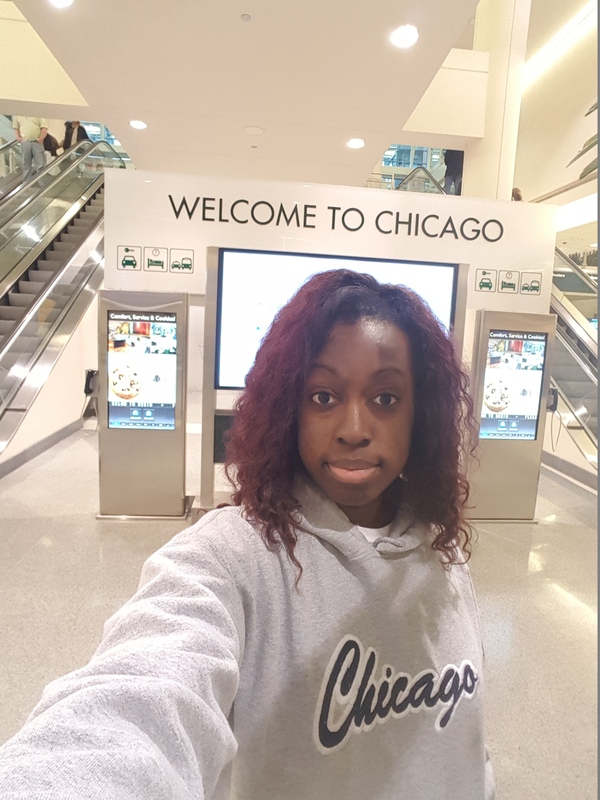 Val speaking … so, let’s just begin by saying this blog is about our journey to Chicago – from the Houston airport to Midway airport. We had an early flight (like the type of early where you only get a couple hours of sleep) and I decided to stay at Kim’s to shave off some time. However, in true 2 Girls fashion, we arrived to the airport 40 minutes before our flight was supposed to take off. We checked our bags with no problem. Of course, Kim is the biggest cheerleader for TSA Pre-Check (basically trusted travelers get to skip long security check lines – it’s expedited). Read more about that here. She breezed through the security checkpoint while a long winding line awaited me. And there were only two lanes feeding into the same security scanner. *watch check* 25 minutes until departure. As each minute passes and the line barely moves, I start to get anxious. But typically I stay rather calm under pressure. I work in a deadline-driven job! But this was getting outrageous. Finally, with only 10 minutes until the flight took off and several people ahead of me in line, I ran to the front and asked people if I could jump ahead because my flight was literally about to leave me. Meanwhile, Kim was on the plane starting a movie. The woman in front of me (God bless her soul) let me jump in front. So I begin flinging all of my belongings in the tray – rip my belt off and toss my shoes. The process literally took so much longer than it had to – swear! Then, fearing the worst, I literally took off in a sprint to the gate. As I approached, the pilot was about to close the door, but I imagine something about my appearance – perhaps it was my belt hanging out of one belt loop, my untied shoes or the sweat dripping down my forehead – they allowed me in. I mean, I did look pretty pitiful. I even had on my Chicago sweatshirt. They closed the door right after me and I found a seat … in the middle … right next to a man who kept giving me the hard elbow. I’m guessing he was banking on an empty seat next to him. I was finally able to check my phone and saw that Kim had texted saying they closed the door and I would probably have to catch the next flight. I texted back saying I was on and turned around to find her and give her the affirmative. She had her earbuds in watching a movie. *Interesting note: The last time I went to Chicago with my old college roommate several years ago, we missed our flights both coming and going. Geez, it’s something about me and Chicago. Hopefully the return trip to Houston will go much smoother!